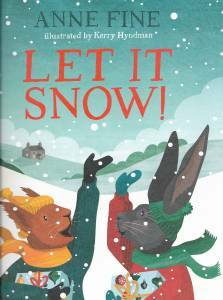 Anne Fine: Let it Snow! When two families get caught in a snowstorm on Christmas eve, it's a disaster! They are all quite sure that Christmas is ruined. Can they work together and turn things around? And will they become firm friends filled with Christmas cheer? It tells a heart-warming tale of two animal families who become unlikely friends by sharing a special meal. I hate working under pressure, so can't for the life of me think what made me agree to write the picture book to accompany this year's Waitrose Christmas advert, with a deadline already looming. Part of the attraction, of course, was that for every book sold in Waitrose, a donation of 50p would be made to The Trussell Trust charity, who now run a network of over 400 food banks. We certainly need those more than I need a tension-free life! I'm also terrible at keeping secrets, and for three months I wasn't able to tell anyone even what little I knew about the chosen theme. I knew only that a group of people find themselves snowed up in a distant pub; and because I live where I do, I thought immediately of the (fairly) nearby Tan Hill Inn, set high in the Yorkshire Dales, and a perfect setting for Kerry Hyndman (the illustrator's) deliciously inviting snowy landscapes. I chose two animal families, the Hares and the Squirrels. They wouldn't be natural mixers, either by background or temperament. And their children get off to a very bad start. But the spirit of Christmas prevails - as it somehow so often does over surrounding stresses - and my story ends, as does the advert, with everyone sharing a warm and companionable meal. Let it Snow! is a book by Anne Fine with illustrations by Kerry Hyndman, inspired by the Waitrose television advertisement for Christmas 2017. It is now available from Amazon UK.